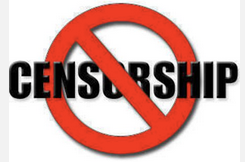 It's time to put an END TO CENSORSHIP! Please Promote This Video. Put it up on your channels and Social Media. It is time for the Illegal Censorship TO STOP. Social media platforms (not Steemit) are controlled and manipulated. Descenting views are being silenced. Protecting descenting views, even if they are in the minority, is protecting everyone's views. Those who think they control the narrative, are politcally correct, and want to stop oposing views may find themselves one day on the wrong side of the "correct speach". It happened in China during Mao. It can happen anywhere.